Imagine that you had the ability to get deep inside your prospects’ thoughts to learn their genuine desires and discover what would make them choose you over your competitors. 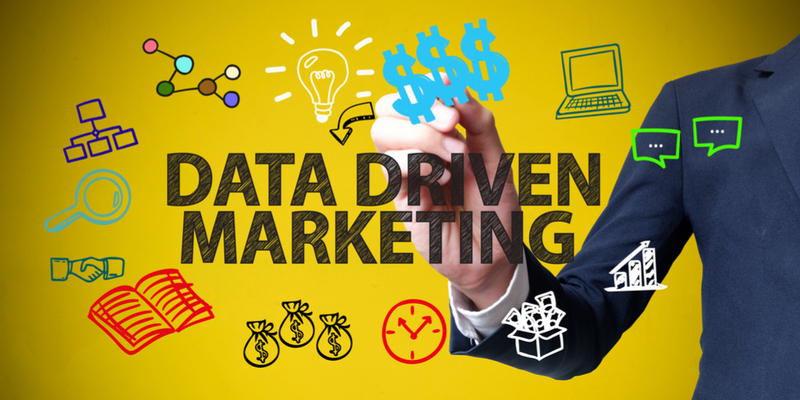 Welcome to Part 3 of our data-driven marketing article series. In this series we are empowering marketers to take advantage of consumer data to build stronger customer relationships that fuel rapid growth. In Part 1, we discussed what data-driven marketing is, its benefits and obstacles and how it can help marketers increase their bottom line. In Part 2, we laid out a step-by-step process model to follow when launching your new data-driven marketing campaigns. 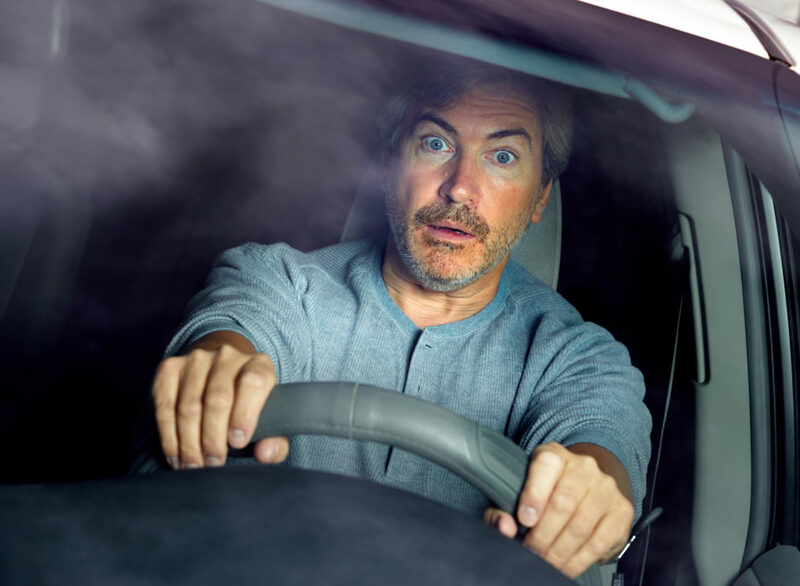 In Part 3 below, we are outlining some key data-driven methods you can use in your campaigns. Gone are the days of publishing random nonrelevant ads to a large audience and hoping and praying for sales. Audience connection is the “new marketing,” and data-driven efforts that deliver relevant, personalized messages are at the forefront of this customer-focused thrust. When customers give you their personal information, they expect to be wined and dined in return for giving you their time, money and trust. Consumers want the royal treatment. They expect you to know and value their needs and interests. When you can do this successfully, they WILL buy. Companies that personalize experiences see, on average, a 19% increase in sales. Personalized marketing isn’t just for customers, however. Your website users and future customers expect great experiences as well. Leveraging data to improve their experiences strengthens their affiliation with your brand and compels them to take the next step in your sales process. Let’s dive into personalized marketing a little more so you can learn how to use your data to create more relevant experiences. Want to turn your website browsing prospects into buying customers? Want to recapture customers and make them return to buy more? Want to build a devoted audience of loyal followers? You guessed it…personalize your marketing. What do you need to personalize your marketing? I know we sound like a broken record when talking about data, but that’s because marketing without it is like driving in circles without a map to a place you have never been, expecting to arrive at your destination. As we discussed in Part 2 of this data-driven marketing series, data allows you to understand customers at a deeper level. When you use this data to provide personalized experiences, customers will feel that you care about their unique individual needs. And this means more than just getting all “kumbaya” with your customers. Nearly 75% of online consumers get frustrated with websites that publish content (e.g., ads, promotions, offers, etc.) that has nothing to do with their interests. If you want to target the 25% who don’t care about personalized experiences, then you can stop reading (for real). But, if you want to join the ranks of marketers who are using data to attract and capture your customers, here’s how you can use personalized marketing in your campaigns. Data from your website users’ behavior can provide insight into their site preferences. Are they clicking on specific links? Are they hovering over one section and leaving another? Are they scrolling far enough on your page to see what you really want them to see? 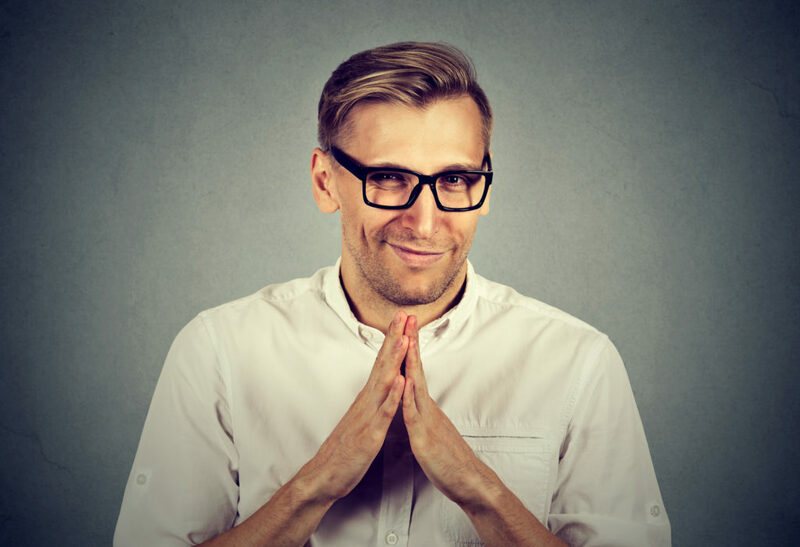 Knowing your users’ preferences allows you to make smart decisions that can improve your user’s experience, which will help increase conversions. Use tools such as Hotjar to get heatmap analyses and watch videos of your users navigating your site. As an example, maybe you noticed that your users are not opting into your sidebar forms. Using this data, test different call-to-action placements like a new position in the sidebar, text links or clear graphics inside the content. Cadbury used the power of personal video stories to launch a successful marketing campaign. The chocolate company collected data from Facebook profiles and used it to create personal videos. The videos featured the prospect’s Facebook photos along with a recommendation for a particular type of Cadbury’s milk chocolate. The campaign resulted in a 65% click-through rate and 33.6% conversions. Using data to personalize your video content can be as simple as reviewing your YouTube analytics to get some information on your viewers. For example, if you notice that a large majority of your traffic is coming from Facebook, ramp up your video promotions on Facebook and decrease it on other sites that are not performing as well. 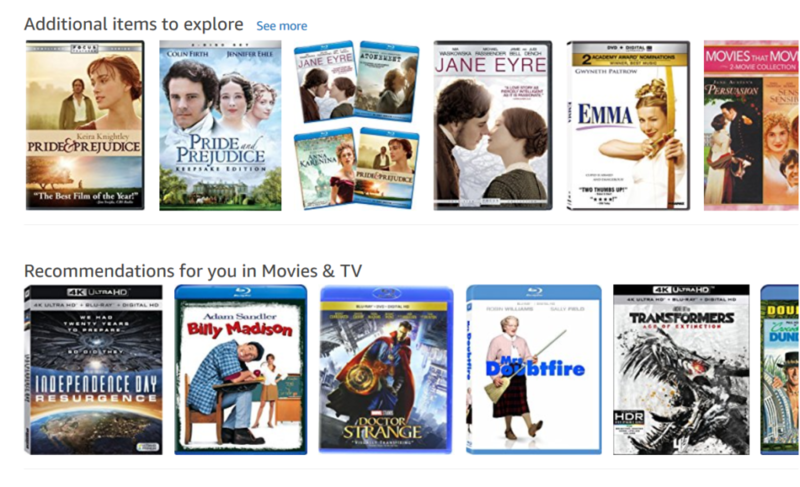 Amazon is the king of personal product recommendations. The shopping behemoth constantly updates its practices to recommend related products to its consumers. 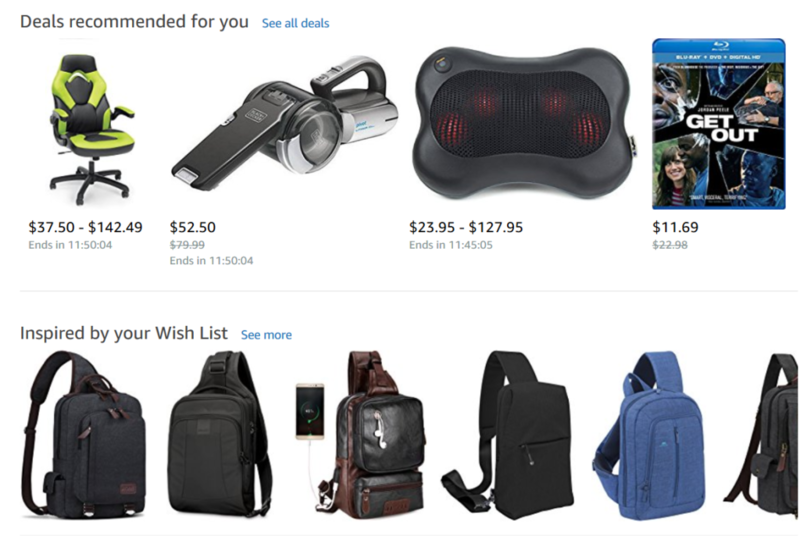 Using personalized data from website behavior and past purchases, Amazon recommends new products at every stage of a consumer’s search. Not as big as Amazon? That’s cool. Most businesses aren’t. But, that doesn’t mean you can’t offer product recommendations. You just need some data from your user’s browsing history and purchases and you will have enough to work with. Check out how NakedWines.com leverages its customers preferences to adopt similar personalization techniques to Amazon. When you hover over “We’re Not Sure,” a text box appears, asking for feedback. The wine company urges customers to provide personal preference information and rate the wines they tasted so it can use this data to personalize their experience and offer better recommendations in the future. What if you could recapture the 98% of your website visitors who leave your site and never take action? 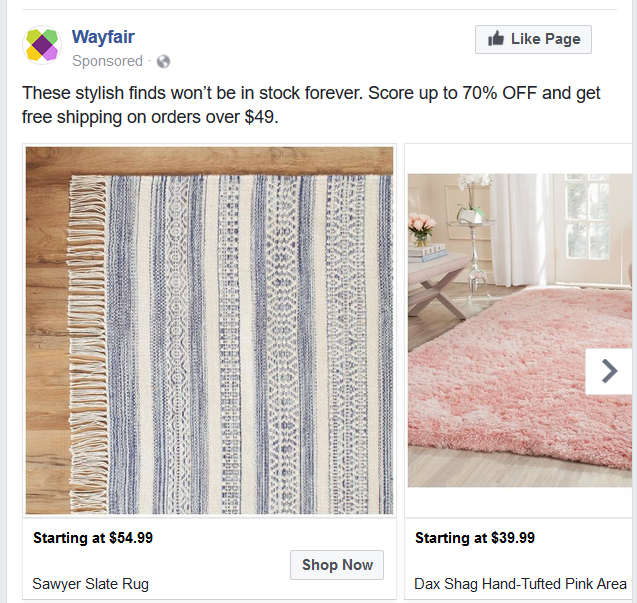 You can with retargeting, and DATA is at the forefront of this technique (shocker, right?). Gather data from the pages your visitors land on and learn more about their interests. Then, use this information to personalize your ads to get a better response. A week ago, I was perusing this website for rugs but did not purchase. The ad features a discount and a low stock warning to nudge me to finish my search and make a purchase. If you are using Facebook retargeting, by inserting a Facebook pixel code on your site, Facebook can then feed you valuable data on your target’s behavior, which feeds directly into your retargeting campaigns. Part 1: What Is Retargeting and How Can It Help Your Business? Data is a sharp arrow in a content marketer’s quiver. Data allows you to pinpoint prospects with your content and satisfy their urges for answers to their problems. Looking for content ideas that will resonate with your audience and get them closer to becoming leads and/or purchasing your products? Then you need to use…you guessed it…DATA. Your data will reveal your audience’s preferences and what type of content they prefer. Do they like longer or shorter content? Do they prefer a specific type (videos, articles, podcasts)? Which part of the buyer’s journey are they in? The key to increasing awareness and getting more leads and sales with your content is to offer the most relevant, valuable content at the right time in the right place. 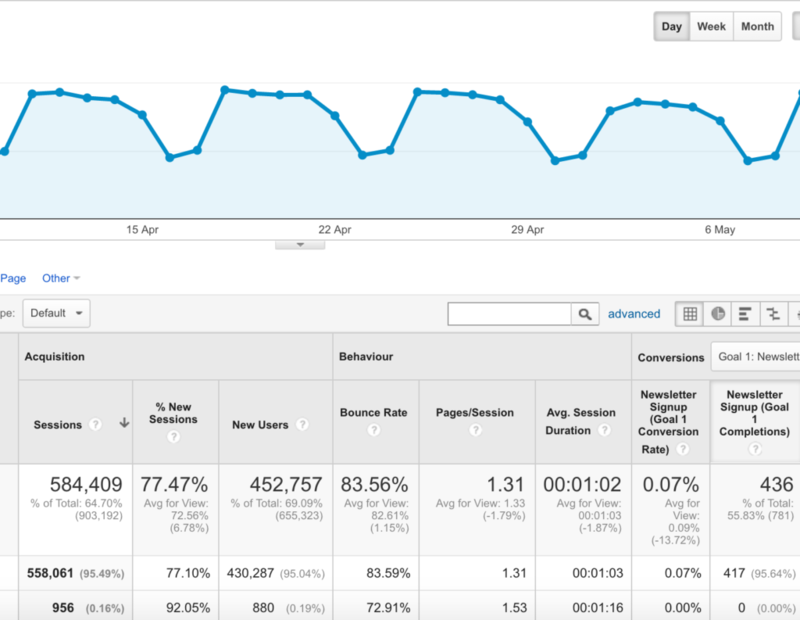 Have a peek at your Google Analytics and review your top content and also your audience’s browsing habits. To simplify, if you find a particular blog topic gets more comments, shares, leads and links, create more content on these popular topics. Also, review your visitors’ interaction with your content with tools like Hotjar (discussed in an earlier section) to determine if any changes would improve their experience with your website. For example, if you have been publishing long-form blog articles but your users are dropping off early without scrolling down to read, consider adding a table of contents or key takeaways at the top to keep them on the page longer. Split test different versions of the same content to see what your audience prefers. Want to know how to spy on your competitor’s data and use it to find content ideas your audience will gobble up? Let’s say you know your audience likes productivity-focused content (you know this from looking at your data! ), but you are having difficulty finding more targeted topics your audience will respond to. Using a tool like SEMRush, search a competitor’s website and discover the top posts on their site. Or, search a website that focuses solely on productivity topics. This is content you know people love! It’s not a 100% guarantee that your audience will love the same content, but if the site is a competitor that targets a similar audience, there is a good chance your audience will love it too. Click on the links and check out the page content. Read the comments and find out what people are saying about it to get some inspiration. NOTE: Don’t copy your competitors. This is a great tactic to get an idea of what content people want to digest. Let it inspire some fresh ideas related to the subject matter. Email marketing is a good option, but email marketing becomes much more powerful when you leverage audience data to segment your campaigns and deliver more personalized messages. How powerful? Personalized, triggered emails boast 25% higher open rates and 51% higher click rates. 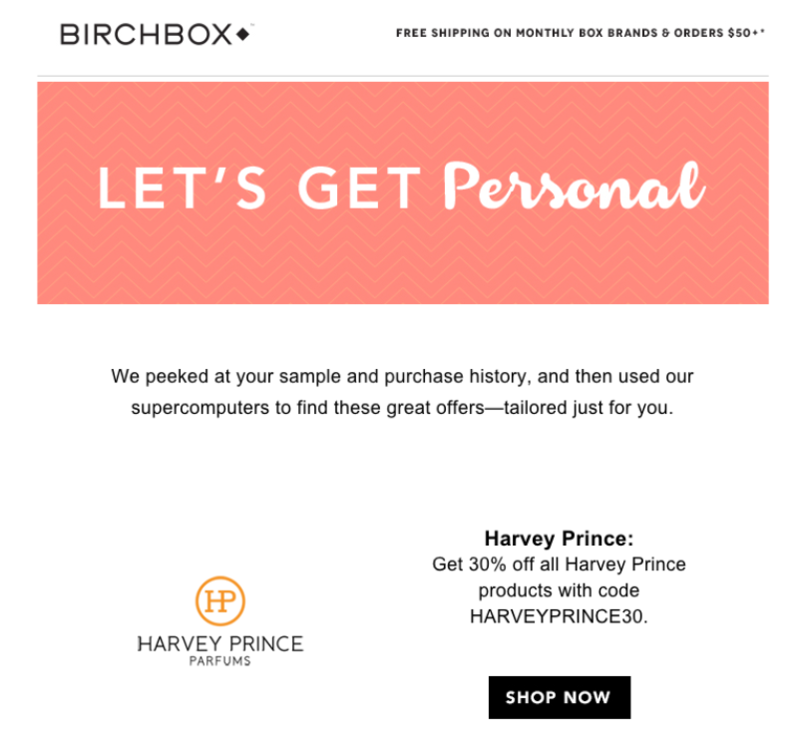 One way to personalize emails is to use email segmentation. Let’s say your brand educates prospects on how to build online businesses. You offer free content pieces on your website to build your email list and you also sell some back-end products. You already know your audience is interested in creating an online business, right? But, this is not enough to personalize your marketing and boost your results. Digging into each of these interest segments will allow you to target your prospects with more personalized offers and increase conversions as a result. You have a lead offer on your blog that teaches people how to sell and build a following on Instagram. Instead of just adding this prospect to one general email list when they optin, add them to a segment of your main list (people interested in Instagram marketing). Most email marketing programs offer email segmenting functionality. When it comes time to sell your Instagram marketing product, you send your emails to this segment because you know there will be an interest. What else can you do with this segment? Send them emails that feature Instagram-related content to build a closer relationship and get better connected with your audience. Use this segmented email list to promote your Instagram product with Facebook retargeting ads as well. Here’s an example of a personalized email from the vitamin manufacturer Vitacost. VItacost is collecting purchase data and sending emails to customers who haven’t purchased in a while. Create multiple versions of an email depending on which subscribers you are targeting (male, female, purchases, interests, etc.). Set up emails to fire after a subscriber takes a specific action. 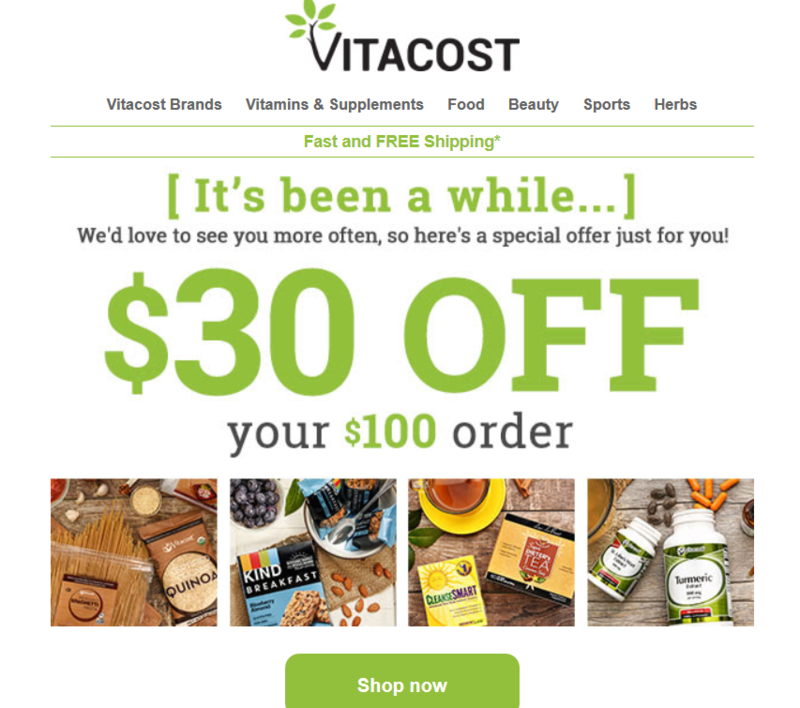 In the Vitacost example, the company set up a trigger to send an email after a duration of time passed from when I purchased last. Other email triggers could include: spending thresholds (vary content according to customer purchase amounts), leaving items in a cart without purchasing, birthday discounts and more. We just scratched the surface of what is possible when leveraging data for your marketing. This is just a tiny fraction of what you can do with user and customer data. Use these techniques as a starting point and keep digging deeper into your data as you get more acquainted with it. In the final article in this series, we will discuss data-driven marketing best practices so you can get the most out your efforts. See you there!